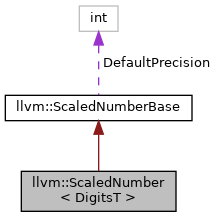 Simple representation of a scaled number. ScaledNumber is a number represented by digits and a scale. It uses simple saturation arithmetic and every operation is well-defined for every value. It's somewhat similar in behaviour to a soft-float, but is not a replacement for one. If you're doing numerics, look at APFloat instead. Nevertheless, we've found these semantics useful for modelling certain cost metrics. The number is split into a signed scale and unsigned digits. The number represented is getDigits()*2^getScale(). In this way, the digits are much like the mantissa in the x87 long double, but there is no canonical form so the same number can be represented by many bit representations. 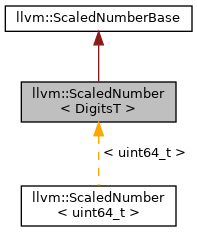 ScaledNumber is templated on the underlying integer type for digits, which is expected to be unsigned. Unlike APFloat, ScaledNumber does not model architecture floating point behaviour – while this might make it a little faster and easier to reason about, it certainly makes it more dangerous for general numerics. ScaledNumber implements most arithmetic operations. Precision is kept where possible. Uses simple saturation arithmetic, so that operations saturate to 0.0 or getLargest() rather than under or overflowing. It has some extra arithmetic for unit inversion. 0.0/0.0 is defined to be 0.0. Any other division by 0.0 is defined to be getLargest(). As a convenience for modifying the exponent, left and right shifting are both implemented, and both interpret negative shifts as positive shifts in the opposite direction. Scales are limited to the range accepted by x87 long double. This makes it trivial to add functionality to convert to APFloat (this is already relied on for the implementation of printing). Turn this into a wrapper around APFloat. Share the algorithm implementations with APFloat. Allow ScaledNumber to represent a signed number. Definition at line 492 of file ScaledNumber.h. Definition at line 495 of file ScaledNumber.h. Definition at line 512 of file ScaledNumber.h. Definition at line 668 of file ScaledNumber.h. Definition at line 671 of file ScaledNumber.h. Definition at line 674 of file ScaledNumber.h. Referenced by llvm::ScaledNumber< uint64_t >::compareTo(). Definition at line 606 of file ScaledNumber.h. Definition at line 525 of file ScaledNumber.h. Referenced by llvm::ScaledNumber< uint64_t >::invert(). Definition at line 534 of file ScaledNumber.h. Definition at line 529 of file ScaledNumber.h. Definition at line 526 of file ScaledNumber.h. Definition at line 522 of file ScaledNumber.h. Definition at line 521 of file ScaledNumber.h. Definition at line 533 of file ScaledNumber.h. Definition at line 520 of file ScaledNumber.h. Definition at line 677 of file ScaledNumber.h. Referenced by llvm::BlockFrequencyInfoImplBase::computeLoopScale(), and convertFloatingToInteger(). Definition at line 676 of file ScaledNumber.h. Referenced by llvm::ScaledNumber< uint64_t >::inverse(). Definition at line 543 of file ScaledNumber.h. Definition at line 544 of file ScaledNumber.h. Definition at line 542 of file ScaledNumber.h. Referenced by llvm::ScaledNumber< uint64_t >::operator*=(), and llvm::ScaledNumber< uint64_t >::operator/=(). The log base 2, rounded. Get the lg of the scalar. lg 0 is defined to be INT32_MIN. Definition at line 553 of file ScaledNumber.h. The log base 2, rounded towards INT32_MAX. Get the lg ceiling. lg 0 is defined to be INT32_MIN. Definition at line 563 of file ScaledNumber.h. The log base 2, rounded towards INT32_MIN. Get the lg floor. lg 0 is defined to be INT32_MIN. Definition at line 558 of file ScaledNumber.h. Definition at line 574 of file ScaledNumber.h. Definition at line 569 of file ScaledNumber.h. Definition at line 801 of file ScaledNumber.h. Referenced by llvm::ScaledNumber< uint64_t >::toInt(). Definition at line 608 of file ScaledNumber.h. Definition at line 616 of file ScaledNumber.h. Definition at line 818 of file ScaledNumber.h. Referenced by llvm::ScaledNumber< uint64_t >::operator*=(). Definition at line 568 of file ScaledNumber.h. Definition at line 623 of file ScaledNumber.h. Definition at line 571 of file ScaledNumber.h. Definition at line 567 of file ScaledNumber.h. Definition at line 570 of file ScaledNumber.h. Definition at line 572 of file ScaledNumber.h. Definition at line 627 of file ScaledNumber.h. Print a string. See toString for documentation. Definition at line 602 of file ScaledNumber.h. Scale a large number accurately. Scale N (multiply it by this). Uses full precision multiplication, even if Width is smaller than 64, so information is not lost. Definition at line 770 of file ScaledNumber.h. Definition at line 659 of file ScaledNumber.h. Definition at line 654 of file ScaledNumber.h. Definition at line 663 of file ScaledNumber.h. Convert to the given integer type. Convert to IntT using simple saturating arithmetic, truncating if necessary. Definition at line 780 of file ScaledNumber.h. Convert to a decimal representation in a string. Convert to a string. Uses scientific notation for very large/small numbers. Scientific notation is used roughly for numbers outside of the range 2^-64 through 2^64. Precision indicates the number of decimal digits of precision to use; 0 requests the maximum available. Definition at line 595 of file ScaledNumber.h.